In December, I fell in love with a piece of furniture that I saw in a design magazine. It’s a chair made out of a suitcase. The furniture designer is in Cape Town and when I inquired about the stock she had available, she sent over a picture of one that I liked even more than the piece in the magazine. 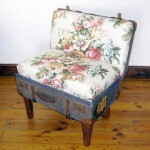 It’s Victorian-looking with its floral-patterned upholstery, priced at R4800 which works out to about $600. I was sold. I think that’s a great price for a unique piece of art that’s functional and that I can sit on! I asked if she could price out shipping it to San Francisco. They’d never shipped anything internationally before. After more than a month researching, they settled on the freighting company with the lowest quote of $400—almost as much as the chair, but I was intent on the purchase. I had to wire the money because the shipping company didn’t accept credit card. That took at least a week to clear. It took almost two weeks for the chair to arrive at the San Francisco airport. They called when it arrived. According to the import supervisor, I had two options: 1) come and pick it up myself for $125 U.S. dollars or 2) have them deliver it for $430! I decided to do it myself, but of course, they’re only open Monday – Friday during business hours. They also said that if I didn’t pickup my cargo by Saturday, the airline would charge me storage fees. I went first to the import supervisor, paid him the money, then he directed me and told me what to do. I had to go to the customs office. After they checked me in at the customs office, I went to British Airways. I filled out paperwork at British Airways, then went back to the customs office. After I finished up at the customs office, I went back to British Airways to collect my chair. It was a lot of back and forth, but not too much time was wasted. I think, in total, I spent an hour between all the different offices. The problem is when I went to retrieve my chair, the handling men all frowned and said it wouldn’t fit in my small car! No matter which way we turned it, it just wouldn’t fit. Luckily, they were very very nice and tore into it for me so that they could get the chair in my car! Otherwise, I would have had to return with a van or truck. I was so pleased that it all worked out!!! So that is my interesting, roundabout experience in acquiring a foreign good.